OK. You know those memories you have that you just wish you could relive over and over? Mine is four years ago last January when Dan and I went to Venice. It was freezing cold, I'm talking wearing tights under jeans cold and feeling that bliss of warm air every time we stepped inside a coffee shop. The trip was to celebrate our second anniversary despite having hardly any money to our names, and it was one of the best experiences ever. You may wonder why I'm telling you this. Well, last year, Dan and I found ourselves at a bit of a crossroads in our relationship. We'd been together over five years, ever since my second year of uni and in a nutshell, the relationship wasn't giving us everything we needed. So, we decided to take a break. A break to figure out several things; one, what sort of people we were on our own, and two, to determine what we actually wanted from our relationship and whether we were able to make it work. Think Ross and Rachel, with guidelines. We still loved each other and the decision was really hard but ultimately we wanted to be stronger than we were and in order to do that, we needed some time apart. Big grown up decision stuff! And that's exactly what we did. It took three months of living apart, lots of talking and periods of not talking and self exploration before we finally decided we were in this for the long haul and got back together. Now, I'm painting an OK picture there, but it was tough. Probably one of the toughest things I've ever had to do, but it was worth it. It meant that we came back together as adults, knowing what we wanted from each other and what we wanted from our relationship. And ever since, we haven't looked back. A massive gamble really, but you already know the ending to this very short 21st Century fairy tale. It all worked out and we are living happily together again with the rest of the story still to be continued. Anyway, like I said that was a year ago, exactly. So to allow ourselves time to revel in how far we've come, celebrate the decisions we've made and to give the occasion the recognition it deserved we decided to have our own little piece of Venice once again and remember the good memories we had. Now, we couldn't actually afford to go back over there at this time, nor would it have been blisteringly cold, which I think added to the romanticism of the city. So instead we went into Covent Garden. Not very Italian I hear you all say. But I would beg to differ with one restaurant called 21. 21 is set on the south facing corner of the piazza in Covent Garden, in what used to be the old Print Room, many years ago. As we arrived it was a bit windy and blowy, so we headed inside. The waitress took us down the stairs, passed the small kitchen filled with lots of Italian chatter down into a private corner of the restaurant filled with romantic lighting and soft music. For starters we ordered a mixture or Wild Boar Tortellini and Parmesan Chips, the intention being to share. However it seems Dan doesn't share Wild Boar Tortellini. When it arrived at the table, it looked small but beautifully presented and I barely had time to whip my camera out before Dan dove straight in. Apparently it was delicious, full of rich flavours and the sauce set it off beautifully. But I wouldn't know - he wouldn't share after all. I would highly recommend the Parmesan Chips however. Small and full of flavour and the perfect size. Trust me it's more than enough, you don't even need to finish the serving as the main courses are enormous! This is where it is just like Italy. I ordered a pizza with a mix of onions, olives, goats cheese and meats (when trying to recreate Rome…well Venice, technically but you get my point) and Dan had Mac 'n Cheese. But neither of us had expected the size of these portions to be as big as they were. They were huge. I reckon the pizza was easily 15 inches and the Mac 'n Cheese seemed like a constantly replenishing bowl. Perfect if you'd been on your feet all day and looking for a hearty meal. The pizza however, was unbelievable. A thin base cooked in a Firestone oven, filled with so much flavour and dollops of goats cheese scattered across it made it just as attractive to the eye as the tongue and it did not disappoint. Each slice tasted amazing, although there were so many olives, I could have done with a few less. I think next time I would also be up for trying the tomato and basil pizza. You know when sometimes you just wish you'd gone for the simple meal. Well the base was so perfectly cooked, and the tomato base so rich, I think that's all you would really need. And the Mac 'n Cheese was made with a really rich cheese sauce which gave it a really strong flavour that meant you could really enjoy every mouthful. Anyway, after a lot of photo taking and rather full tummies we left the restaurant and headed out into Covent Garden where we were instantly serenaded by a classical group performing Pachelbel Canon in the main piazza outside the wine bar. It was beautiful music and everyone was enjoying it. Especially as they were quite a young group really and we were reliably informed had been playing together for about three years. So, we donated what change we had left and then meandered about town. Sometimes there is nothing better that idly walking about. Nowhere to be and nothing to do! And trust me, Covent Garden is a great place to do just that. So, we popped into Gallery One to check out some artwork, Dan got so into it I had to pretty much drag him away before he actually put down a deposit on something. He was drawn to three pieces in particular, what do you think to his taste? 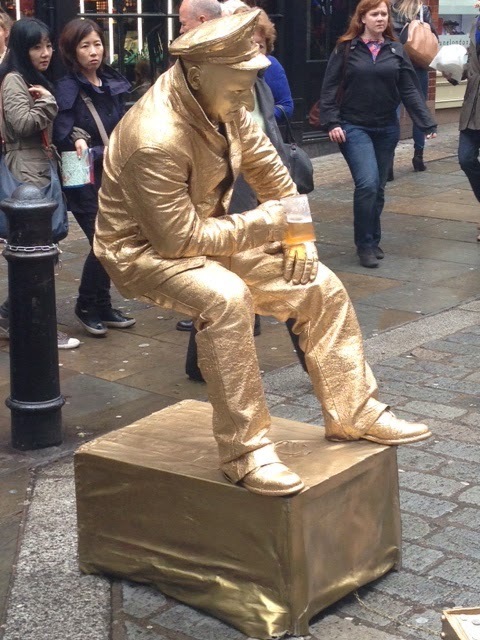 I also love seeing the street performers in Covent Garden, they just seem to up their game so much more than anywhere else - and for the life of me, I could not work out how this guy was doing this. 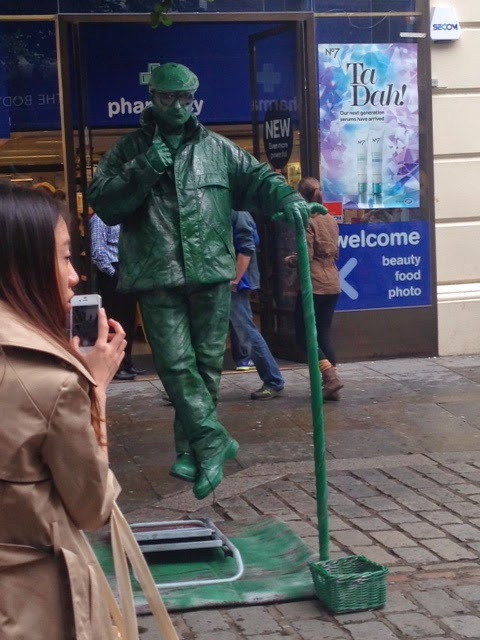 He was moving his free arm and legs, and I was so impressed, naturally I gave some pennies. This other guys however, I think there must be something metal up his trousers. "Is that a metal chair up your trousers or are you just pleased to see me?" Bad joke?? All in all, it was a great day, allowing Dan and I to remember just how much fun we have just being together and why we're such a good team - I mean those painting were well over a couple of thousand pounds….